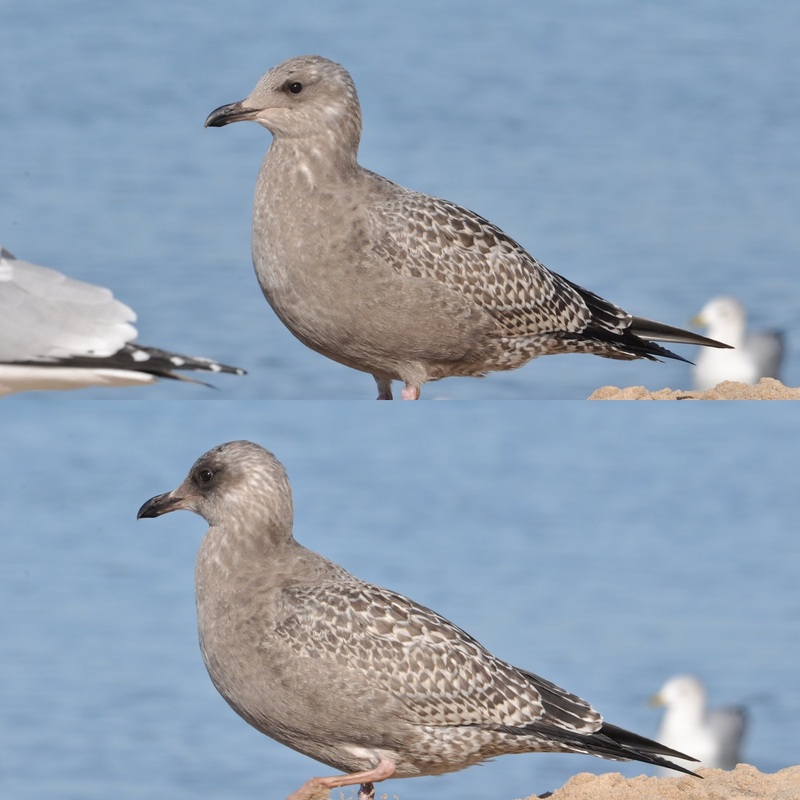 First summer (2nd cycle) Bonaparte's Gulls with similar aged Little Gull. Sheboygan, Wisconsin. 14 July 2013. The Bonaparte's on the far left looks paler than the other five. Does it suffer from a pigmentation condition that's yet to be explained by ornithologists? Of course not. It happens to be the only individual (along with the Little) that is almost exactly parallel with the camera lens (i.e., the observer). The other five Bonaparte's are all facing towards the observer's ten-o'clock. A slight change in this so-called angle-to-observer can dramatically change our perception of the grays we're seeing. The effect is multiplied on sunny days. Here the Little Gull appears at least one shade darker than the Bonaparte's which is not accurate (Kodak Gray Scale actual values: Little Gull 4.5-5.5, Bonaparte's Gull 5-6). Juvenile American Herring. New Buffalo, Michigan. 17 November 2012. Although probably without any serious implications for identification, the face on the lower image is now darkened (or shall I say the face on the bird in the top image is now lightened?). Kenn Kaufman's reaction to this set verified my point with precision: "This is an outstanding example of the ways in which a single photo (or even a short series of photos) can be misleading...I'm dismayed when I see people arguing strongly for a difficult ID on the basis of a single shot; it's so hard to be sure which "field marks" are real and which are photographic illusions".